One of the biggest questions is everyone’s mind nowadays is where is the pound heading to. In this article I will express my opinion on what’s to happen in the near and far future, using layman’s terms. Do this mean things will definitely go down this route that I envision? Absolutely not. When it comes to economics, politics and foreign exchange rates (all closely tied) no one really knows what’s coming. This is merely a speculation based on what I’ve been seeing so far. If you want to read more from me and my staff view our week-by-week currency predictions. What will make or break the pound? The “leave” vote has been casted more than a year ago and there are no resolutions in sight. PM May has announced she is aiming for a “soft brexit”, if such thing exists at all, that will not alienate the UK from the single market. She did pass the Customs and Trade bills and came out victorious at the Parliament but she had to rely on the support of 4 Labour MPs, not exactly the most sustainable thing for her as things stand. After David Davies and Boris Johnson were sacked / resigned, the situation is chaotic and volatile and there is little confidence that PM May will be able to execute what she desires to. The thing that will make the pound make, or break, is whether a Brexit agreement will be formed in the coming months, before the people, the EU, and the market will reach a definite conclusion that there is no agreement (i.e. a hard brexit). Will any agreement of an orderly brexit will bring back confidence to the pound? Probably not, but once any agreement has been reached, it is likely that the downslide of pound will stop (but not surely going to recover its rates). What are the chances of an agreement taking place? In my opinion, the chances are slim. 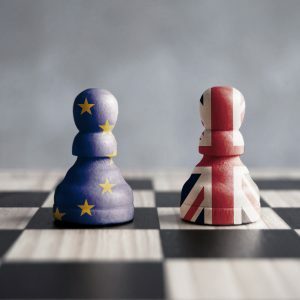 The EU’s stances on the brexit negotiation were very rigid right from the beginning, and it doesn’t seem, or at least not reflected back to the media, that that these stances have changed over the course of the year. The EU is well aware of the fact a hard brexit will be devastating to the British economy, and they will make the best out of the situation (which is ill-favoured to them to begin with, because the EU would have been better off with UK). The disarray and fear rising in the UK will only refuel the flames, it is now more apparent than ever than that the EU will essentially decide on the state of economy in UK for the next 5-10 years at least. Even if a well-balanced agreement was to be achieved in negotiation, PM May is hanging by a thread and may very well not be able to pass the bills, and even if she does manage to push it through, there may be a serious backlash from the public that voted for a brexit and did not mean a semi-brexit or a quarter-brexit. Then, you have the timing element. The markets won’t wait much longer before the pound comes crashing down like a china doll. It was already expected to have a finalised brexit agreement by now, and May’s lack of assertiveness does not reassure the markets things will bode well. If a deal is made by October, it passes, and regarded as a good deal for the British economy, the Sterling may jump 5-7% back to the 1.20’s (against the Euro). If a deal is made by October, passes but it is seen as the kind of deal that May was forced into complying with and is not favourable enough with economy, we are seeing the 1.15-1.18 range as fit (pretty much where it’s been at over the past few months). If a deal is made by October, but PM May is unable to pass it, it signals a “no-deal” and pound will shift below 1.10 against the Euro, and may reach parity by year’s end. If no deal is made by october, it signals a “no-deal” and pound will shift below 1.10 against the Euro, and may reach parity by year’s end. Out of these scenarios, there is almost no upside to the pound. Only if the best scenario takes place we will be experiencing 5-7% increase, but in every other situation the GBPEUR will either stay where it is now, or decline. Hence, if you are considering exchanging your GBP to EUR and waiting for the “rates to improve”, we think it’s unrealistic. Better to pull the trigger now than to expect big hopes from a nation that voted “leave”.